Question 1. 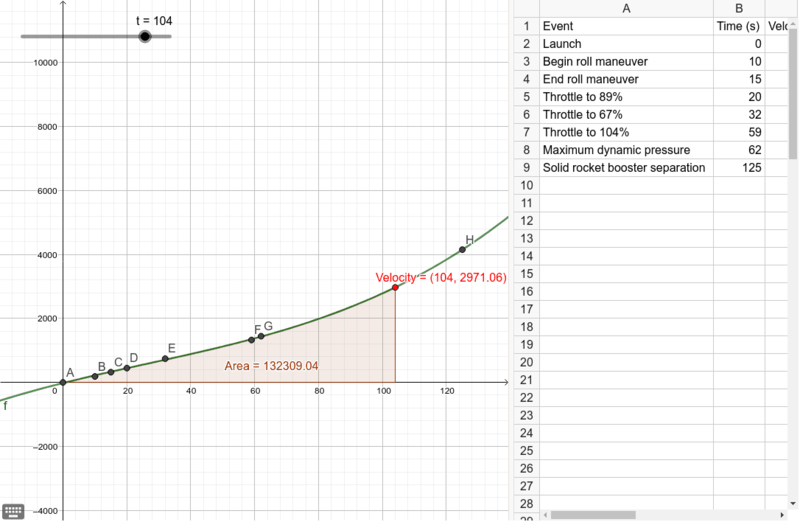 Using the given GeoGebra applet, Endeavour, model these data by a third-degree polynomial. (Use “fitpoly” command) Question 2.Use the model in part (a) to determine the distanced traveled by Endeavour at time t=125. Question 3.Find the rate of changes in the distance (area under the graph) from t=98 to t=100, and compare it to the velocity at t=100. Do it again from t=99 to t=100. (Hint: Use the area of a thin rectangle that fits under the velocity graph on the interval) Question 4.Explain how the instantaneous rate of change in the travel distance would be as the time difference goes to zero.